Eventually it happens to everyone. As we age, even if we’re healthy, the heart becomes less flexible, more stiff and just isn’t as efficient in processing oxygen as it used to be. In most people the first signs show up in the 50s or early 60s. And among people who don’t exercise, the underlying changes can start even sooner. “The heart gets smaller — stiffer,” says Dr. Ben Levine, a sports cardiologist at University of Texas Southwestern Medical Center and director of the Institute for Exercise and Environmental Medicine at Texas Health Presbyterian Hospital, in Dallas. “That’s what happens to the heart and blood vessels,” he says. And down the road, that sort of stiffness can get worse, he notes, leading to the breathlessness and other symptoms of heart failure, an inability of the heart to effectively pump blood to the lungs or throughout the body. Fortunately for those in midlife, Levine is finding that even if you haven’t been an avid exerciser, getting in shape now may head off that decline and help restore your aging heart. He and his colleagues published their recent findings in the American Heart Association’s journal, Circulation. Dallas resident Mae Onsry, an accounts payable manager, was 62 at the time. Raising two children and working full time, she says she never had the flexibility to fit in exercise, although she knew it was important for her health. “I have my hobbies,” says Onsry, including ballroom dancing and gardening. But it was nothing routine, nothing “disciplined,” she says. So, when she saw a flyer about Levine’s study, she signed up — along with 52 other volunteers — for a two-year study. Participants were randomly assigned to one of two groups. The first group engaged in a program of non-aerobic exercise — basic yoga, balance training and weight training — three times a week. The other group, which Onsry was in, was assigned a trainer and did moderate- to high-intensity aerobic exercise for four or more days a week. “We took these 50-year-old hearts and turned the clock back to 30- or 35-year-old hearts,” says Levine. Their hearts processed oxygen more efficiently and were notably less stiff. The hearts of those engaged in less intense routines didn’t change, he says. A key part of the effective exercise regimen was interval training, Levine says — short bursts of high-intensity exercise followed by a few minutes of rest. The study incorporated what are often referred to as 4×4 intervals. 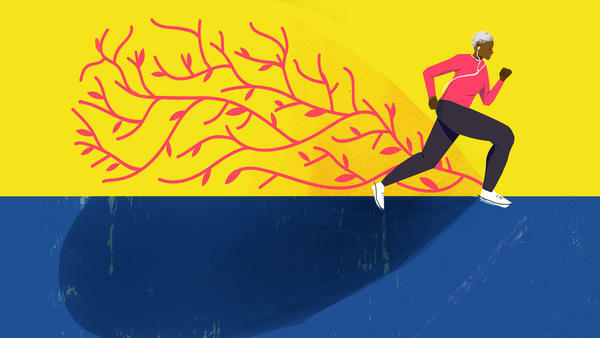 “The sweet spot in life to get off the couch and start exercising [if you haven’t already] is in late middle age when the heart still has plasticity,” Levine says. You may not be able to reverse the aging of the vessels if you wait. Anyone considering beginning this, or a similarly strenuous exercise program, Levine says, should check with their doctor first, and ask about individual health issues that might warrant a less intense program initially. For Mae Onsry, who is now 65, the study was life changing. Today she exercises every day of the week, walking and jogging at least 5 miles around the lake near her home. If she misses a day, she says, she just doesn’t feel as good physically. And the regimen has helped her mental health, too. Dr. Nieca Goldberg, a cardiologist and medical director of the Joan H. Tisch Center for Women’s Health at NYU Langone Medical Center, and a spokeswoman for the American Heart Association, says Levine’s research is important.